It is important to keep an eye on your orders to ensure that they reach your customers successfully. After the order is fulfilled, you can find its tracking code in the Shopify admin and Oberlo. This article shows the ways you can track your orders in Oberlo. If you are a Pro or Basic subscription plan merchant, you can use the "Order tracking" feature to track your orders directly in Oberlo. Navigate to the “Order tracking” page and from here, use filters to filter out orders that interest you. If you click on the tracking code, you can see the progress of the shipment in more details. Oberlo syncs tracking codes every few days, however, if your tracking code has not been synced for a while, you can click on the “Retrack” button. Oberlo will re-sync the tracking code and provide the latest status. 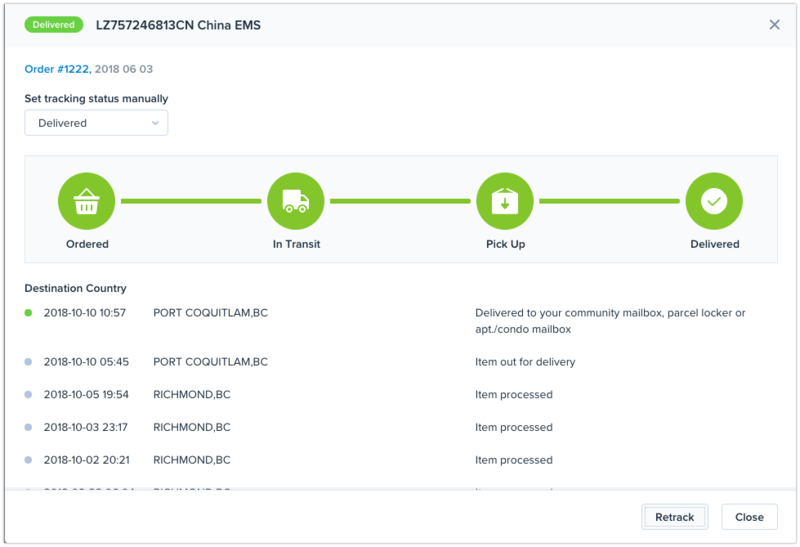 We would recommend to pay most attention to the orders that appear under the “Requires attention” filter, because you will want to take some actions to ensure that all shipments reaches your customers successfully. To see such orders, mark “Requires attention” checkbox. Each shipment status helps to decide what actions you should take. Here are some situations and potential further actions, that may be helpful to you. 1. If the tracking code has not been recognized or activated for a long time, you may want to track the code outside Oberlo, for example, on the carrier’s official website. If the tracking code appears to be invalid, we would recommend to open a dispute with the supplier. 2. If the shipment got lost in transit, got retained at customs, or the destination country does not match your customer’s shipping country, you may want to open a dispute with the supplier. 3. If the shipment has not been picked up by the customer, or the carrier could not deliver the package to your customer, you may want to get in touch with your customer asking to initiate the pickup of the package. This tracking code status means that the order has just been processed and there is no tracking information yet. It may take around 5-7 days until the tracking information will start showing up. This tracking code status means that either the supplier provided a faulty tracking code, that does not exist or Oberlo is not able to recognize it. This tracking code status means that the shipment has been dispatched or departed from its country of origin. It can also mean that the package has arrived its destination country and is pending for the customs inspection. This tracking code status means that the package arrived at the local delivery point or is out for delivery. Generally, the carrier has a collect deadline, therefore, we would recommend you to contact your customer asking to arrange the package pickup. This tracking code status means that the package was in the transportation period for a long time and was not delivered. It can also mean, that the package got lost during the transportation. This tracking code status means that the shipment undergo unusual shipping condition, this may happen due to several reasons. For example, the shipment was refused by the customer, incorrect/illegible/incomplete address, expired retention period, customer’s absence. Also, the package might be retained by the customs department due to any of these reasons: contains prohibited goods; importation of the goods is restricted; retained by customs due to tax payable, or any other unspecified reasons. Finally, the package may have suffered damage or was lost during the transportation period. This tracking status means that the package was attempted for delivery, but failed. Potential reasons are: customer was not available at the time of delivery; delivery delayed and rescheduled, customer requested later delivery, or there was an address problem - unable to locate premises, rural or remote areas. This tracking status means that the package has been returned to the supplier in this case we would recommend contacting the supplier. This tracking status means that the package was successfully delivered to the customer. If the customer claims that they did not get the package, we would recommend contacting the carrier for the clarification. You can track your orders on various package tracking websites. Simply copy the tracking code of the order and paste it into the tracking website. Information about the status of the shipment appears within 3 - 7 days after the order is shipped by the supplier.